Emperors who lived centuries ago rarely help modern-day policemen solve their crimes. But in Ahmet Ümit’s latest mystery novel, a string of bizarre killings force three police detectives to scour the history of their city for solutions. All the victims are found near historical locations in Istanbul’s old city, beginning with the site of an ancient temple erected for King Byzas, the city’s first monarch. Every subsequent monument is also associated with a major figure from Istanbul’s past, each more recent than the last. As the death toll rises — and it does so precipitously, with seven murders in seven days — history figures more and more vitally in the tale. It’s the ultimate history lesson: lives literally depend on the detectives’ ability to quickly learn the city’s most famous rulers, monuments, and events. 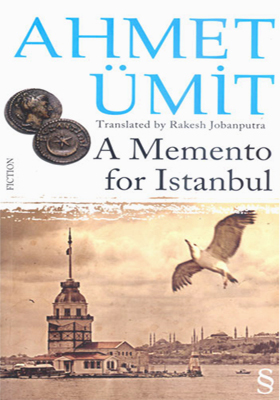 Far from writing a novel as dull as a history textbook, however, Ümit infuses Istanbul’s history with the tense excitement of a first-rate detective mystery. Readers might be surprised by the colorful historical characters and events woven into the story. Few may know, for example, that the architect of Fatih Mosque had his hands chopped off on Sultan Mehmet II’s orders because the dome of the mosque was smaller than the dome on the Hagia Sophia. And while you may have heard of the mighty Byzantine emperor Justinian, how about the fact that he nearly fled Constantinople during the populist Nika Uprising, but was dissuaded by his wife, the former prostitute Theodora? Contemporary Istanbul is just as much a part of the action. The detectives’ search for the killer takes them all over the old city, from Beyazıt to Bayrampaşa. A host of familiar Istanbul characters people the pages: homeless drunks, venal businessmen and their stooges, corrupt lawyers and journalists, archeologists, and idealistic citizens campaigning to preserve Istanbul’s historical sites. Over the course of their investigation, the detectives’ fictional confrontations often highlight real tensions alive in Istanbul today. In Fatih, one detective unfamiliar with Istanbul’s more conservative Muslim population exclaims in horror that the neighborhood “looks more like Iran than Turkey,” and balks at the Arabic names on the buildings. When the detectives question a villainous real estate tycoon, he compares those who oppose his developments to the movement against the first Bosphorus Bridge: “And what do we have now? Earnest discussions regarding the construction of a third bridge.” The same tycoon appears a little more sympathetic when describing the forced migration he made as a child out of the Kurdish province of Hakkâri — a familiar story for many Kurdish immigrants to Istanbul. The novel is narrated by Chief Inspector Nevzat Akman, who, if real, would be one of the most thoughtful and upstanding police officers Istanbul has ever known. Unfortunately for him, however, many of his colleagues are drawn a little more true to life. Ümit’s own biases, of course, may be apparent here. He was an active member of Turkey’s Communist Party for15 years, and joined the underground democracy movement after the military coup of 1980. It would be unsurprising if he didn’t harbor some resentment or mistrust toward Turkish law enforcement. In general, however, the author’s own politics are impossible to discern from the story. Nevzat and his fellow officers are occasionally guilty of abusing their authority, or inflicting casual violence on suspects before they have real evidence against them. But which longtime Istanbul residents haven’t seen police act that way in real life? For most of the story, A Memento for Istanbul races along. Ümit skillfully leavens descriptions of the detectives’ frantic activity with historical interludes. The mystery at the heart of the book is particularly masterful: readers are given all the information they need to guess it, but few will. (This reviewer certainly didn’t.) The action only drags when Nevzat launches into melodramatic memories of his painful past, or passes time with his girlfriend: a shallow character who adds little to the story. A Memento for Istanbul is exactly what its title promises, although at nearly 600 pages, it might be more appropriately termed a monument for Istanbul. Ümit’s novel captures the Istanbul of today, but also contains the city’s many previous incarnations. What better souvenir for a city could there be?